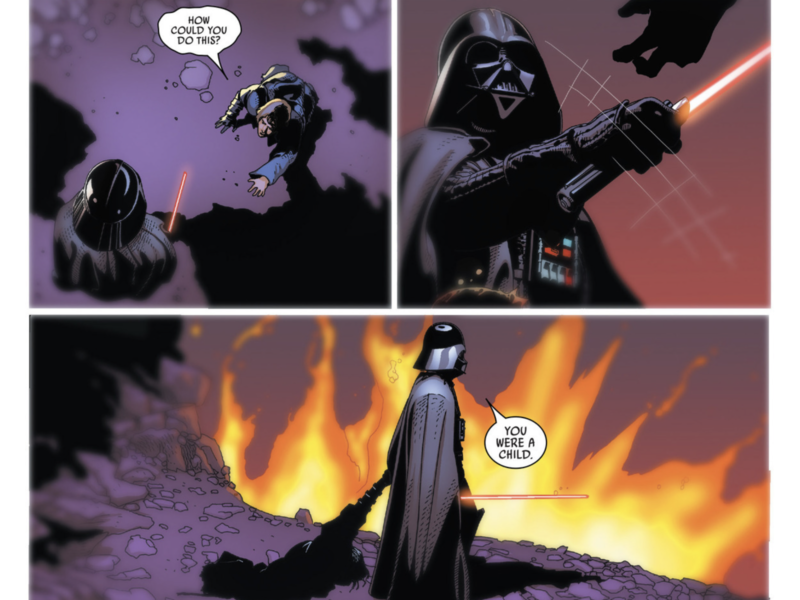 I absolutely tore through the omnibus Kindle editions of the Darth Vader comic (one of several in the rebooted Marvel line). I guess it really paid off for Amazon to make Volume 1 free to Prime members because it hooked me fast. I ended up buying Volumes 2 through 4 as well as the crossover event Vader Down. Combined, they cost me about what a standard novel would, and they were well worth the money. The series begins just after the destruction of the (first) Death Star at the Battle of Yavin. Darth Vader, sole survivor among the Imperial leadership, is held responsible by the Emperor and suffers loss of face and position. He begins a clandestine campaign to regain his status before the Emperor, or if need be, to replace the Emperor. The bulk of the series deals with Vader and his competitors among the top enforcers of the Empire. The story crosses path only intermittently with the familiar heroes of the main saga — a wise choice, since many options are closed off to the writers by the known canon of the movies. 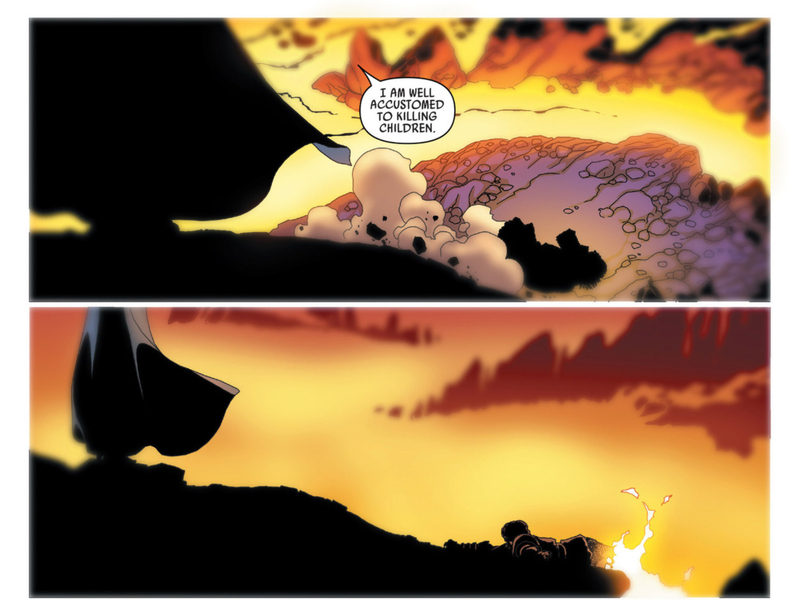 I loved this series because it redeems Vader — not in the sudden, almost cloying sense of Return of the Jedi, but as a truly fearsome archvillain. More than strong, more than evil, he is nearly (if you’ll forgive the pun) a force of nature. While he faces real challenges in the course of the comics, his determinator nature shines through and catapults him above the difficulties put in his way. His justifiedly unassailable confidence carries him forward through his enemies with such unequalled badassery that you find yourself cheering him … and then looking on appalled as he casually slaughters witnesses and innocents. Whenever Vader goes up against normals (best captured in Vader Down), they react as if he’s the stuff of nightmares — because he is. Strong in the Force and skilled at combat, his greatest strength is his own indomitable will. … and why he could defeat him. That is just amazing … leveraging the slaughter of the younglings into a persistent psychological scar and making Vader into so much more than the lessened creature that the prequels shaped him to be. David Prowse and James Earl Jones did an amazing job infusing the cinematic Vader with menace, but the movies only really hint at the threat represented by Vader. These comics fill it in, limning him in darkness and despair-inducing peril. 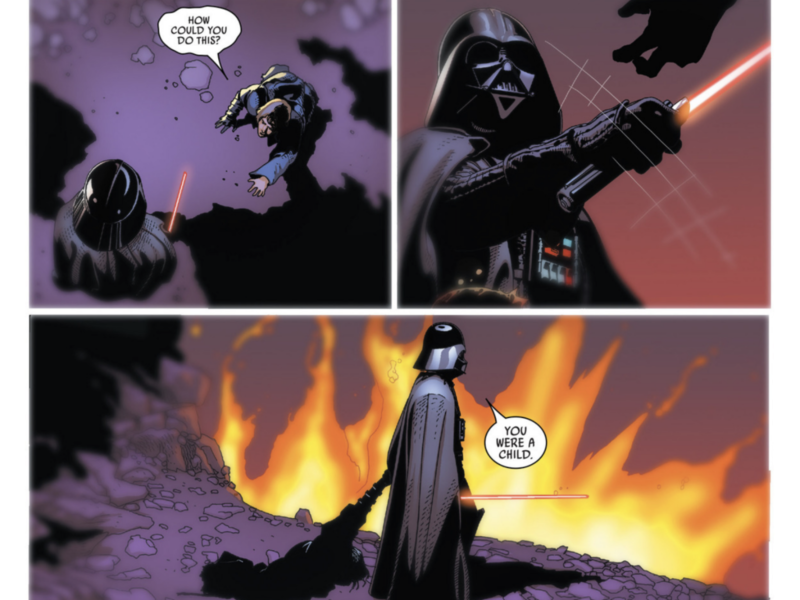 In these books we see that Vader is not just of the Dark Side — he is the Dark Side given form. Yet, he is more than a one-dimensional cartoon villain. (And let’s be honest, the films tread dangerously close to painting him this way.) His motivations are complex and his emotional needs, though muted, still raw. When he discovers that the lucky X-Wing pilot who destroyed the Death Star is named “Skywalker”, something stirs in him. When he further finds that the pilot is from Tatooine, that something roars to life and a sparks a quiet but intense heat. For an ongoing comic series in a multimedia universe, there are constraints of history and format. You know that Vader is going to not only survive any challenges but triumph over them — the films give us no other contenders for the Emperor’s favor. You know that Vader isn’t going to capture or kill Luke, or Leia, or Han. You know that he is going to kill Admiral Ozzel, in one of cinema’s most famous examples of being a Bad Boss. But those constraints also open up possibilities, allowing sly winks and knowing nods to the future events that we, as readers, know are coming down the pike. All in all, despite not really being a fan of modern comics (I just don’t get their visual vernacular), I really enjoyed these. It was for me the right mix of new and nostalgia, and a worthy addition to the reborn Disney-approved universe.